While coffee has many benefits, including its high antioxidant content, the drink also has many ‘side-effects’ such as interrupted sleep and a feeling of overwhelming anxiousness that has sent many people searching for coffee alternatives. But what are the coffee alternative trends? In 2016, chai latte was the latest coffee alternative trend, however, after consumers discovered that it can contain up to 20 teaspoons of sugar they moved on to matcha lattes. The global matcha market size was valued at $2.62bn in 2016 according to Grand View Research, with an expected growth at a compound annual growth rate (CAGR) of 7.6% from 2017 to 2025. However, in 2018 turmeric lattes became the newest trend with sales of the golden beverage surpassing those of matcha by 260% according to card and payment processing company Square. Turmeric, originally used medicinally in South Asia for over 4,000 years, has recently been growing in popularity for its health benefits, especially its powerful anti-inflammatory effects. The popularity of the antioxidant root has begun a trend of turmeric lattes. Turmeric has even been branded as ‘new kale’, with celebrities and health gurus claiming it can improve memory, as well as the appearance of the skin. 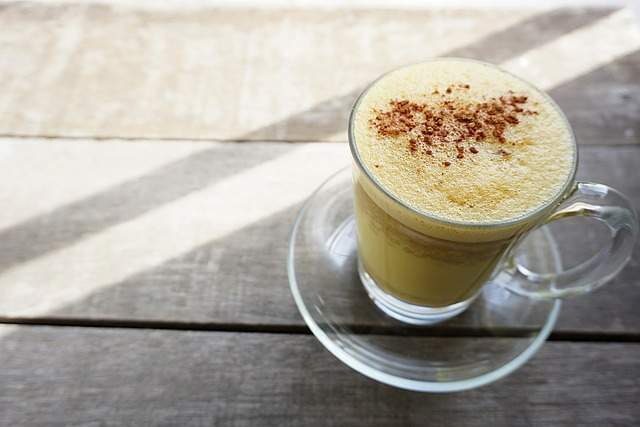 Turmeric lattes contain no caffeine, are known as ‘golden lattes’, and are typically made from almond or coconut milk, fresh turmeric, cinnamon, ginger and honey. According to data collected by Hitwise, there has been a 471% year-on-year spike in searches for ‘mushroom coffee’, with the bulk coming from those aged 25 to 34. Mushroom coffee tends to be a blend of regular ground coffee mixed with a powdered fungus, which gives the drink an earthy taste. Different mushroom types are liquefied and dried to create the powdered substance. To make it more palatable it’s often sold with milk or a milk variant and a sweetener. Mushroom coffee has been consumed in Northern Europe since at least the 1940s. But it’s only now that there is ‘enough demand and appetite’ for the unlikely pairing in the UK, according to Catriona Spence-Ishaq of Roots Deli and Salad Bar in Edinburgh. While a fungi-based drink might not sound very appealing, mushroom beverages are being hailed as the new superfood by health and fitness bloggers around the world. Australia’s national science agency, the Commonwealth Scientific and Industrial Research Organisation (Csiro), has developed powder made from broccoli, to add to lattes. The idea behind the broccoli latte is to increase consumers’ intake of vegetables, which is a problem both in the UK and Australia. According to the Food Foundation, the vast majority of the UK population consumes less than three and a half portions of vegetables a day instead of the recommended five. To make broccoli coffee, the vegetable is dried, ground into a fine powder and them scooped into the coffee. Two tablespoons of broccoli powder contain one serving of vegetables. The creators of broccoli coffee used unappealing broccoli that might not sell in grocery stores, also reducing food waste. While designed for use in coffee, broccoli powder can be used in smoothies and eaten with oats. Cascara, a Spanish word for ‘skin’, refers to the outer layer of the coffee berry, which usually doesn’t make its way into coffee. Cascara is sun-dried and brewed similarly to tea, and but has similar levels of caffeine to regular coffee. Taylors of Harrogate coffee specialist Rick Tingley believes that the growing demand for Cascara is ‘due to consumers becoming more environmentally conscious’, as the drink uses coffee cherries which would otherwise be discarded. As coffee cherries are high in iron, fibre, antioxidants and protein, it is no surprise that Cascara is growing in popularity, with leading coffee chains, including Starbucks, launching a limited-time cascara latte.